Decision-making is a compound movement, mainly when studied in the reality of the clinical setting. Decision making is a complex, cognitive, process that is defined as choosing a particular course of action. Furthermore, effective decision making is grounded on both personal characteristics and the ability to think critically. The purposes of this study were to identify the perceived actual level of nurses decisional involvement, determine the preferred level of decisional involvement, identify decisional dissonance, determining concordance between staff and management perceptions of actual and preferred levels of decisional involvement and examine the influence of demographic characteristics such as age, gender, educational level, and years of experience on the nurses decisional involvement at various positions. 1) What is the perceived actual level of decisional involvement? 2) What is the preferred level of decisional involvement? 3) Is there dissonance between staff and management perception of actual and preferred levels of decisional involvement? 4) Do demographic characteristics such as age, gender, educational level, and years of experience influence the nurses' decisional involvement? Decisional dissonance: the degree of difference between actual and preferred levels of decisional involvement by study sample. The study conducted in seven hospitals (governmental and private sector) in Amman, Jordan. Governmental hospitals included: Al-Bashier, Al-Sult, Al-Tutangi, and Prince Hamza hospital. While, the private hospitals included: Ibn-Alhytham, Arab Medical Center, and Al-Khaldi hospital. Hundred and thirty staff nurses, on charge nurses, first line manager, nursing supervisor, and nursing director; male and female nurses were included in the study. Characteristics of sample involved age, gender, years of experience, educational level, and nurses' position. Decisional involvement is operationalized through the Decisional Involvement Scale (DIS) (Formally the Distribution of Authority Scale) which was developed by Havens and Vasey . It consists of 21 items, measures actual and/or preferred decisional involvement for staff nurses and managers on a nursing unit. The DIS uses a five likert point scale to indicate the degree to which decisions are the responsibility of staff nurses and administration/management on the nursing unit. A high score suggests a high degree of staff nurses involvement, a low score suggests a low degree of staff nurses involvement, and a midrange score suggests a state of sharing of decision-making between administration/management and staff nurses. DIS measures nurses involvement in decisions and activities related to six constructs: unit staffing, quality of professional practice, professional recruitment, unit governance and leadership, quality of support staff practice, and collaboration/liaison activities. Development of the DIS was guided by a theoretical framework that was grounded in the literature on professional nursing practice and the sociology of the professions. DIS content validity is high (1.0). Reliability of the DIS has been assessed through determination of Cronbach’s alpha. A total scale alphas ranging from (.91) to (.95), subscale alphas have consistently ranged from .68 (subscale related to collaboration/communication) to 85 (the remaining five subscales). Data were collected after official permission was approved from the selected hospitals. Confidentiality was granted for study participants through anonymity of data collection questionnaires, as well as autonomy for all participants to feel free to participate in the study and withdraw from the sample at any time without any risks for the participant was granted. Informed consent was obtained from each nurse agreed upon participation in the study. Data were collected over a period of six months from January to June 2007. Questionnaire was provided for the participants and the researchers were available for any explanations for the questionnaire. In order to achieve the study objectives the following statistical methods were utilized. Frequencies to describe the study sample, T-test and one way ANOVA test to differentiate between means of ascribed demographic variables. The study implied that there are no correlation among actual decision involvement, age, education and experience; a larger sample size may reveal the correlation among them. 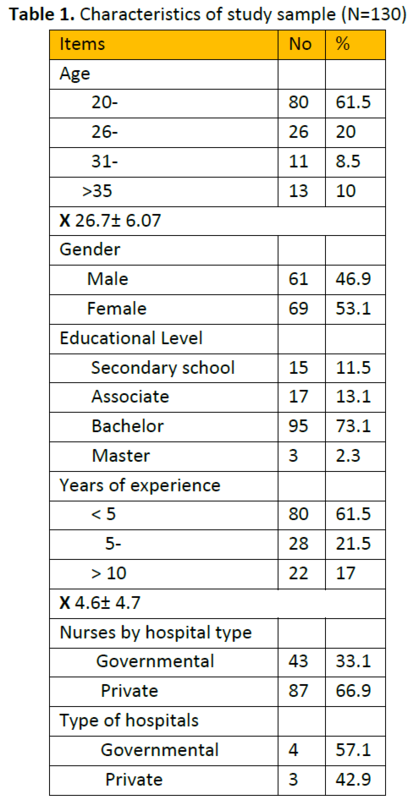 Table 1, describes the study sample characteristics; as shown the majority of study sample aged 20-25, and minority of them aged 31-35with "mean (SD)" age is amounted to 26.7, 6.07. Female nurses were a little bit more than male nurses, with majority of the sample had bachelor degree in nursing while the minority had master degree. Regarding years of experience; majority of the sample had less than five years of experience, on the other hand, the minority had more than ten years of experience with "mean (SD)" estimated at X 4.6, 4.7. In relation to the hospital type; majority of study sample were from private hospitals although governmental were more than private hospitals. 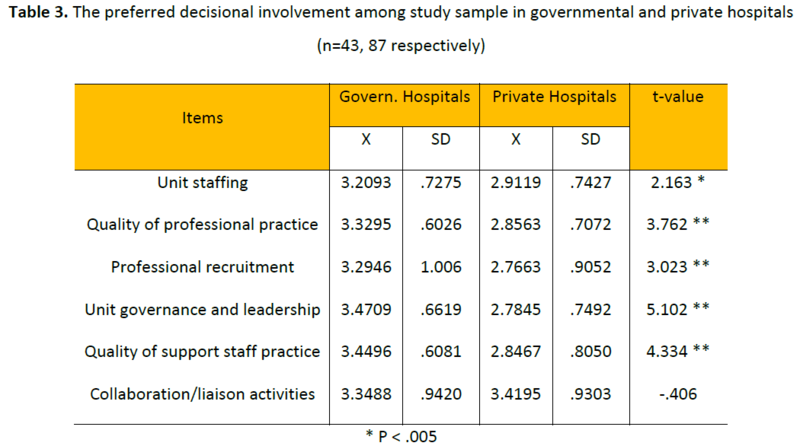 Table 2, shows the actual decisional involvement of study sample in governmental and private hospitals. The table indicated that nurses have a midrange score that suggests a state of sharing of decision-making between administration/management of staff nurses in the governmental hospitals, while, nurses have low degree of staff nurses involvement in decision making in the private hospitals. There were also highly significant relationships among all aspects of decisional involvement between nurses in the governmental and private hospital except the collaboration aspect. The table implies that nurses in the governmental hospitals have more decisional involvement than nurses in the private hospitals. Table 3 (see Annex), reflects the preferred decisional involvement among study sample in both governmental and private hospitals. The table concluded that there were highly significant differences in the preferred decision making among study sample in both sectors in all items only unit staffing that has significant difference and only collaboration activities has no difference in the two sectors. 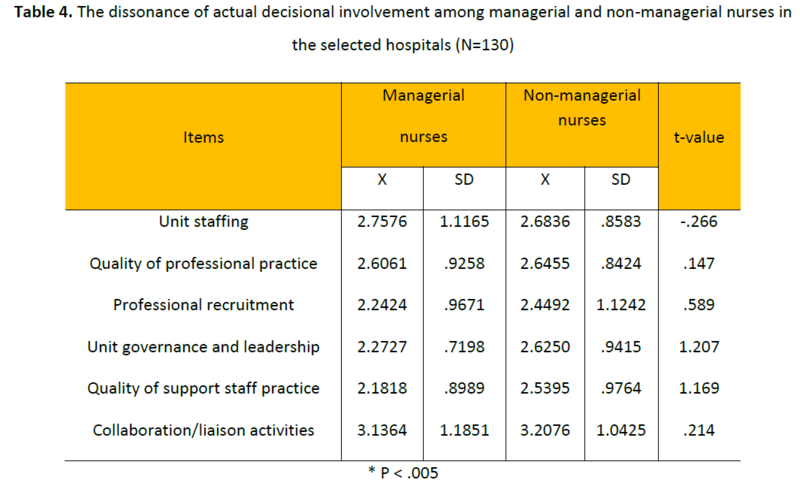 Table 4 (see Annex), describes the dissonance of actual decisional involvement among managerial and non-managerial nurses in the selected hospitals. 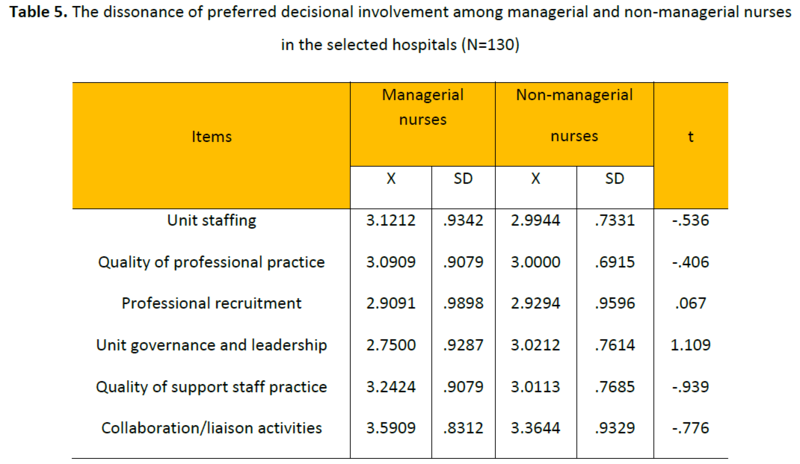 This table revealed that there were a decisional dissonance in the actual decisional involvement between managerial and non managerial nursing personnel only in unit governance and leadership and quality of support staff practice. Table 5 (see Annex), reflects the dissonance of preferred decisional involvement among managerial and non-managerial nurses in the selected hospitals. 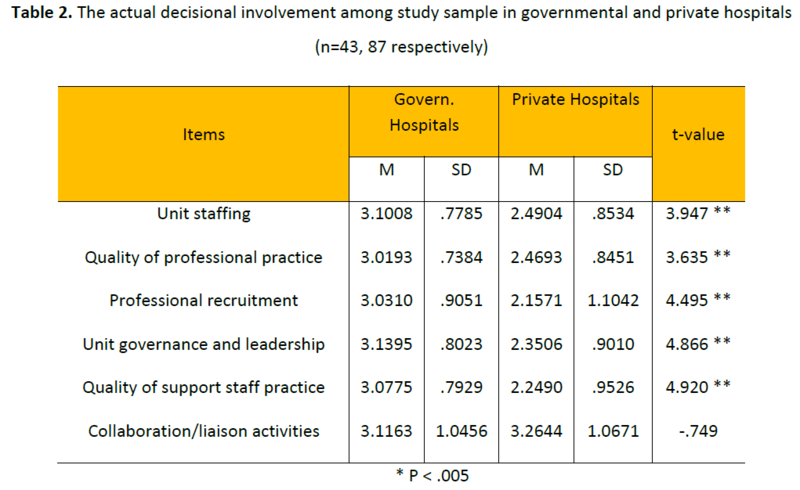 The table implied that there was a decisional dissonance in the preferred decisional involvement between managerial and non managerial nursing personnel in the unit governance and leadership item only. 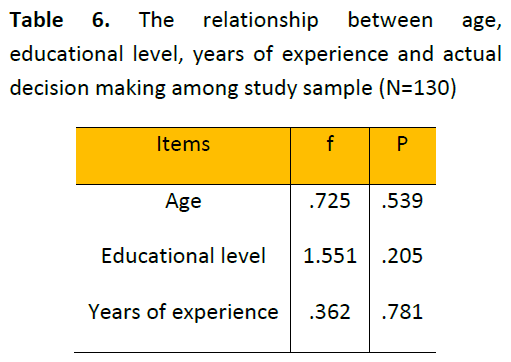 Table 6, shows the relationship among age, educational level, experience, and actual decision making among study sample. The table implies that none of the variable has a relationship to the decision making among study sample. The relationship between age, educational level, years of experience and actual decision making among study sample were investigated in this table. The table indicates that there were neither a relationship between actual decision making nor age, educational level, and years of experience among study sample in governmental and private hospital. Table 7, describes the relationship between gender and actual decision making among study sample. 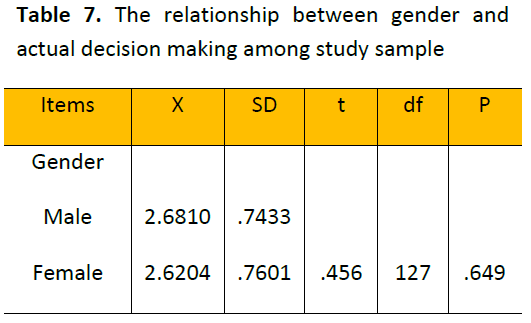 The table indicated that gender has no relationship to the actual decision making among study sample. The present study revealed that majority of study sample were female working in private hospitals had an age between 20-25 years old, with a bachelor degree in nursing and have less than five years of experience. The study also indicated that there were no relationships among age, gender, educational level, years of experience and actual decisional involvement among study sample. Only type of hospital has a highly significant relationship to decision involvement i.e. nurses working in governmental hospitals have more involvement in decision making than nurses in private hospitals. Perhaps, this could be because private hospital are more concerned with patients as they pay for the health services they rendered, therefore hospital management does not share nurses in their decisions. Furthermore, there was dissonance between actual and preferred decisional involvement among managerial and non-managerial nursing personnel with more preference of nurses to be involved in decision making than they already practice. These results were congruent with the study conducted by Mangold et el.,  which was conducted to determine the level of actual and preferred decisional involvement and ascertain whether there was a decisional dissonance among registered nurses (RNs). In addition, the impact of level of education, years of experience, hours worked per pay period, and working setting of actual and preferred decisional involvement were measured. The study concluded that a statistically significant difference was found between RNs actual and preferred decisional involvement, with RNs preferring more decisional involvement than they actually experienced. Work setting was the only variable to which a difference could be attributed. Furthermore, barriers to clinical decision-making in nurses in Australia were examined by Hoffman et al. The aim of this study was to examine whether nurses in Australia participated in clinical decision making to the extent they desired. Some factors that could be inhibiting or promoting participation in clinical decision making, namely educational level, occupational orientation (role values), level of appointment and area of practice (medical/surgical) were also examined. A quantitative, correlational study was utilized. The study showed that nurses holding a professional role value participated more in clinical decision making than those with a paramedical role value. Nurses participating in surgical areas participated less in decision-making than those in medical areas. While a higher educational level was not associated with greater participation in clinical decision-making, it was linked to wanting more participation in this process. Additionally, Scherbet al.,  conducted a descriptive study exploring staff nurse and nurse manager ratings of actual and preferred decisional involvement and differences between staff nurses and nurse managers. A sample of 320 RNs from a Midwestern health care network was surveyed using the Decisional Involvement Scale. Nurse managers and staff nurses had statistically significant differences in their perceptions of who was involved in actual decision making in the areas of unit governance and leadership and collaboration or liaison activities. There were statistically significant differences in preferred decisional involvement between staff nurses and nurse managers in the overall DIS scale and the subscales of unit governance and leadership and quality of support staff practice. Moreover, Hicks et al.,  conducted a pilot study to examine the relationship of education level, years of critical care nursing experience, and critical thinking (CT) ability (skills and dispositions) to consistency in clinical decision making among critical care nurses. The study utilized a non- experimental and correlational research design. Fifty four critical care nurses from adult critical care units in 3 private teaching hospitals were the sample of this study. The majority of nurses held a BSN or MSN and had an average of 9 years of direct clinical experience in the care of the critically ill. The study implicated that education and experience were not related to CT ability, nor was CT ability related to decision-making consistency. On the other hand, Nooritajer and Mahfozpour  evaluated the participation level of head nurses in decision making and its relation to their satisfaction with participative level in the educational hospitals of Iran University of Medical Sciences and Health Services (IUMSHS). A self-reported questionnaire was utilized to conduct this study. 94 head-nurses working in the educational hospitals of IUMSHS, all having employment background of over 6 month in their present word, were investigated and formed the sample study. Data analysis revealed that 40.4% of the head-nurses reported their participation in decision making was moderate and 55.4% of the reported their satisfaction level with participative decision making was also moderate. A relatively strong and statistically significant correlation was observed between participation in decision making and satisfaction with participative decision making (p=0.001; r=0.661). The study concluded that there was a dissonance in the actual and preferred decisional involvement between managerial and non-managerial nursing personnel. Nurses in the governmental hospitals had more decisional involvement than nurses in the private hospitals. Both managerial and non-managerial nurses need more participation in decision making than they already practice. Only type of hospitals (governmental versus private) had relationship to the nurses' involvement in decision making in the study sample. Finally, nurses and nurse managers are in need for more involvement in decision making than they already do. For further research studies; barriers to nurses involvement in decision making need to be explored. Conduction of other research studies are needed for better identification of factors improves or impedes decisional involvement among nurses. This research article was funded by the deanship of research and graduate studies at Zarqa University, Jordan. Burns JP. Complexity science and leadership in healthcare. Journal of Nursing Administration. 2001; 31: 474–482. Marquis LB, & Huston CJ. Leadership roles and management functions in nursing: Theory and application (6th ed.). Philadelphia: Lippincott Williams & Wilkins. 2009. Davar RS. The Human side of management. New dahlia: UBS. 1996: 208-210. Layman Elizabeth J. Decision making for health care managers and supervisors: Theory into practice. Health care manager. 2011; 30(4): 287-300. Carey L. Practice Nursing. London: Baillier Tindall. 2000: 279-304. Bucknall TK. Critical care nurses’ decision-making activities in the natural clinical setting. 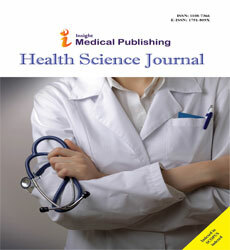 Journal of Clinical Nursing. 2000; 9: 25–36. Ellis JR, Hartley CL. Managing and coordinating nursing care. (4th ed.). Εds Lippincott Williams & Wilkins, Philadelphia,2005. White JE, Nativio DG, Kobert SN, Engberg SJ. Content and process in clinical decision-making by nurse practitioners. The Journal of Nursing Scholarship. 1992; 24:153-158. Smith Higuchi KA, Donald JG. Thinking processes used by nurses in clinical decision making. Journal of Nursing Education. 2002; 41:145-153. Benner P, Tanner C, Chesla C. Expertise in Nursing Practice: Caring, Clinical Judgment and Ethics. Eds., Springer, New York, 1996.
International Council of Nurses. Participation of nurses in health services decision making and policy development. 2008. Thompson C, Cullum N, McCaughan D, Sheldon T, Raynor P. Nurses information use, and clinical decision making: The real world potential for evidence-based decisions in nursing. Evidence-Based Nursing. 2004; 7: 68–72. White A.H. Clinical decision-making among fourth-year nursing students: An interpretive study. Journal of Nursing Education. 2003; 42(3): 113–120. Adib HM, Salsali M, Ahmadi F. The factors facilitating and inhibiting effective clinical decision-making in nursing: A qualitative study. BMC Nursing. 2004; 3(2). Retrieved March 15, 2010, from http://www.biomedcentral.com/1472-6955/3/2. Hancock HC, Durham L. Critical care outreach: The need for effective decision-making in critical practice (part 1). Intensive and Critical Care Nursing.2007; 23: 15–22. Williams E. Participative management. Georgia State University, Atlanta, GA. 1976. Miers M, Porter S. Power and Nursing practice, London. Mac Milan press LTD. 1999. Mullins LJ. Management and Organizational Behavior. (5th ed. ), F.t. Pitman.2000: 661-663. Kath C. Management in general practice: the challenge of new general medical services contract. British Journal of General Practice.2004; 54: 734-739. Foot SH, Hook C. Introducing human resource management. Longman. 1999: 347. Kramer M, Schmalenberg C. Magnet hospital nurses describe control over nursing practice. Western Journal of Nursing Research. 2003; 25: 434–452. Blegen MA, Goode C, Johnson M, Maas M, Chen L, Moorhead S. Preferences for decision-making autonomy. Image: Journal of Nursing Scholarship.1993; 25(4):339–344. Specht JK. The Effects of Perceived Nurse Shared Governance on Nurse Job Satisfaction and Patient Satisfaction [dissertation]. Iowa City: University of Iowa. 1996. Kreitzer M. Impact of Staff Nurse Participation in Decision-Making on Job Satisfaction and Organizational Commitment [dissertation]. St Paul, Minn: University of Minnesota. 1990. Burns SK, Grove N. The practice of nursing research: Conduct, critique, and utilization. (4th ed.). Eds., W.B. Saunders Company, Philadelphia, 2001. Polit DF, Hungler BP. Nursing research: Principles and methods. (6th ed.). Eds., Lippincott, Philadelphia, 1999. Havens DS, Vasey J. Measuring staff nurse decisional involvement: The decisional involvement scale. Journal of Nursing Administration.2003; 33(6): 331-336. Mangold K, Pearson KK, Schmitz JR, Specht JP. Perceptions and characteristics of registered nurses' involvement in decision making. Nursing Administration Quarterly. 2006; 30(3): 266-272. Hoffman K, Duffield C, Donoghue J. Barriers to clinical decision-making in nurses in Australia. Australian Journal of Advanced Nursing.2004; 21(3): 8-13. Scherb CA, Specht JKP, Loes JL, Reed D. Decisional Involvement: Staff Nurse and Nurse Manager Perceptions. Western Journal of Nursing Research.2011; 33(2):161-179. Hicks FD, Merritt SL, Elstein AS. Critical Thinking and Clinical Decision Making In Critical Care Nursing: A Pilot Study. Heart and Lung. 2003; 32 (3): 169-180. Nooritajer M, Mahfozpour S. Evaluating the participation level of managers (head-nurses) in decision making and its relation to their satisfaction with participative in the educational hospitals of Iumshs (Iran University of Medical Sciences and Health Services). World Applied Sciences Journal. 2008; 3(4): 603-608.